Description: Priced to sell! 3 bdrm ranch condo in excellent condition! 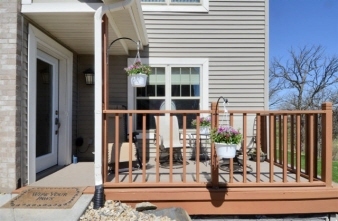 You'll love this beautiful end unit condo w/ private entrance & deck backing to conservancy area w/ nice views. This open floor plan is great for entertaining & boasts a large kitchen w/ maple cabinetry. Breakfast bar & large pantry. The dinette is open to living rm w/ corner fireplace & view of conservancy. 3rd bdrm works great as an office or large guest rm. Large private 2+ car attached garage & large storage area! Must see! !